In his book “American Nations,” Colin Woodard divides the continent into 11 distinct territories. It’s tempting to think about the United States as a pretty monolithic country and culture. Certainly, if you listen to the views of Continental Europeans or people from the Middle East, it seems that’s how many around the world view us. And now we have an interesting book that really delves into the phenomenon of America’s distinct regions. In his book American Nations, published in 2011 and now available in paperback, journalist and author Colin Woodard takes us on an interesting regional tour of the continent. Woodard counts no fewer than eleven “nations within a nation.” And as he defines them, they’re actually spread throughout the United States, Canada and Northern Mexico. What exactly are these “nations within a nation” and how did they come to be? They’re the result of early settlers, later migration patterns, and deep-seated cultural affinities that, while somewhat mitigated in recent years, are still surprisingly resilient even after 150 or 200 years. 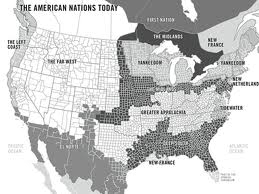 “Yankeedom nation” stretches from New England and Upstate New York to the Midwest, encompassing Northern Ohio, Michigan, Wisconsin and Minnesota. According to Woodard, this region’s character and social culture stem from the utopian communities founded by Puritans and the later immigrants from Scandinavia. In “Yankeedom nation,” intellectual achievement is valued along with an abiding belief in public institutions’ ability to improve and even perfect society. Understanding these attributes makes it easier to see how the Grange Movement, Robert LaFollette’s Progressive Party and even RomneyCare came into being here rather than in some other part of the United States. The polar opposite of Yankeedom may well be “Greater Appalachia nation,” a region on Woodard’s map that stretches from Southwestern Pennsylvania west and south to encompass nearly the entire states of West Virginia, Kentucky and Tennessee along with vast swatches of contiguous states. Also referred to as “The Borderlands,” this “nation” also includes areas we don’t usually associate with Appalachia such as the Ozarks, Oklahoma, Central Texas and even a bit of Eastern New Mexico. What ties this sprawling “nation” together? The eastern portions of the region were settled not by English planters, merchants or Puritans, but by Scots-Irish immigrants who brought with them a fighting spirit along with a sense of fierce independence and suspicion of central governments. They and their descendents later migrated to the western regions, bringing their cultural predilections with them. Think of John McCain’s fighting spirit – whose ancestors settled in Mississippi from further east – and you have a flavor of the abiding characteristics of this region. The great observer of American politics, Michael Barone, has written about Greater Appalachia nation’s antipathy to the social and governmental policies of the current administration in Washington, DC. He notes that even as President Obama has won the White House twice with relative ease, he’s actually fared worse with voters in the Borderlands region when compared to the unsuccessful efforts of John Kerry and Al Gore, losing every county in the states of West Virginia, Arkansas and Oklahoma and carrying precious few anywhere else. 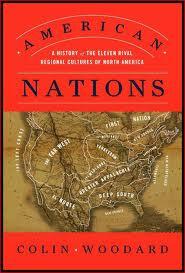 Woodard’s book delves into a great deal of rich regional history in order to reveal to us how these and the other “nations” came to be. It’s a fascinating volume that will surely spark some of your own thoughts and perceptions of “America” – in whole and in part. If you have some personal observations or experiences that illustrate the regional differences in the country, please share them in the comment section below. As for myself, I’m a person who was born in the “Tidewater nation” and who has relatives in the “Deep South nation.” When attending high school in the Twin Cities (smack in the heart of “Yankeedom nation”), I found it interesting how clueless my otherwise intelligent, knowledgeable and well-traveled schoolmates were about anything to do with the Deep South. In particular, Mississippi and Alabama were always being mixed up in their minds. Interesting article. Yet it’s all about what you want to see, and I wanted to throw in my 5 cents. In all countries, even the very small ones, there are vast differences. Take The Netherlands, with the Catholic South and the Protestant North. Or Belgium, with the French and Flemish divide. Or Germany…there is still a “cold war” between Koln and Dusseldorf going on. In China, a very large country, people in one part of the country speak a completely different language from those in another part of the country. I certainly don’t mean to discredit the author here, and I am sure that one will find the differences as described by him. I’ve traveled throughout the USA (and the rest of the world) extensively and I agree; Florida is different from the Midwest, which is different from the South and the West coast. Yet the USA is also a country where there is a strong single ‘American’ identity. American society really seems to embrace the idea of standardization, and it shows. In a shopping mall in Alaska you will find exactly the same chains as in a shopping mall in Florida. The food supply across the USA, mainly of the processed kind, ensures that most Americans from North to South and East to West have a very similar diet. The language comes with accents but is typically the same (with the exception of Spanish in certain areas), which is quite unique for such a large land mass. And so on. So, to answer the question, depending on your viewpoint you can certainly discover nations within the USA. From an international viewpoint, however, the USA remains one of the most homogeneous nations in the world, in spite of its large number of immigrants. In 1989, historian David Hackett Fischer published Albion’s Seed: Four British Folkways In America. In it, he argued that different parts of America inherited substantially different folkways from various waves of early settlers and that many of these regional characteristics still persist. For example, the liberal politics of Massachusetts evolved out of the area’s early puritan ethos, while the Scots-Irish immigrants who settled in the Southern interior brought with them a strong sense of clan and a corresponding suspicion of outsiders (cultural, geographic, ethnic, and otherwise). I seem to remember that he attributed Southerners’ penchant for living in double-wides (trailers) to the collective memory of centuries of constant warring along the Scottish border that necessitated repeated packing up and moving on. An interesting theory, to say the least! While early immigrant patterns certainly shaped regional cultures here, there are new immigration patterns and culturally homogenizing technologies emerging that are stirring the pot. People always migrate to where the opportunities are, even more so in a sluggish economy. Certainly Nashville, where I grew up, is today a radically transformed city. Someone recently told me that in the five years he’d been in town, I was the first native Nashvillian he’d met. Gulp! But I suspect many cities — Charlotte, Austin, certainly Palo Alto — are seeing similar flux. And of course, flux impacts culture. Today, most people who work in large American cities are getting to know “fusion living,” a vibrant, eclectic lifestyle “salad” that is replicating itself coast to coast. Still “regional culture” has strong appeal. While natives may complain that they no longer own the cultures they grew up in, it’s amazing how hard newcomers try to adopt the obvious regional “adornments.” New Yorkers in Nashville will immediately pick up “y’all” and start eating fried chicken. But of course, this is ersatz culture. It’s like the Paris tourist board paying kids to make out on benches along the Seine. The fact of the matter is, we no longer study much history in school, much less local history. Most of us have no sense of place—simply because we move around so much. So regional culture is reduced to “you guys” v.”y’all”; crab cakes v. fried catfish. The Nashville that has taken shape in the last forty years looks no different than Kansas City. Still, ersatz regional culture certainly survives, and tourists love it: paddlewheel riverboat cruises, dude ranches, bluegrass festivals, etc. I suspect old regionalisms will increasingly give way to new “clusterings,” not based on shared folkways (except ironically where there are large immigrant communities), but increasingly on shared political or economic values. Bill Bishop talks about this in his book The Big Sort. People who move to Texas today don’t do so because they like a certain way of life (much less stetsons or brisket). They do it because they like low taxes and/or what they perceive to be better employment opportunities. And they’re more comfortable living among other people who feel the same way about taxes and politics as they do.